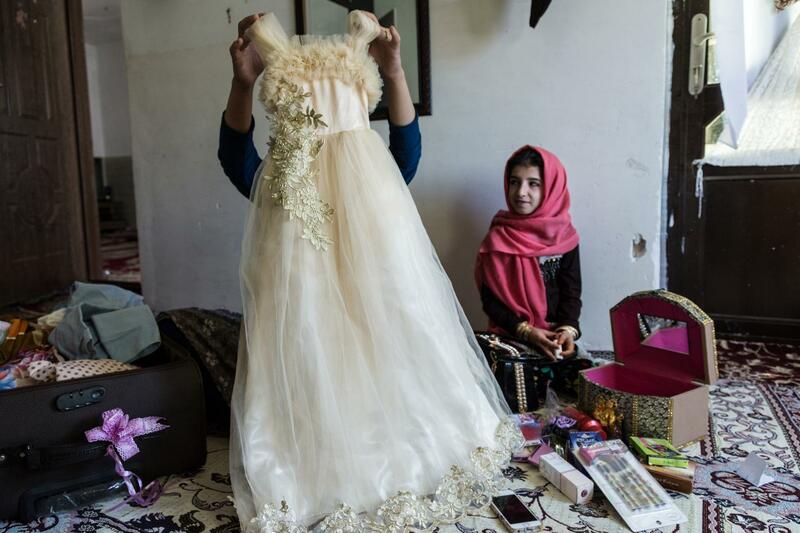 Child marriage is a serious issue in Iran’s current sociological climate. According to the law, Iranian girls are ready to be wed at the age of 13 and Iranian boys can take a wife at 15 years old, claiming mere teenagers not yet emancipated from their parents have the sexual and social maturity, civil understanding and competence of starting a family or simply entering a legal contract of such magnitude.The official records of National Organization for Civil Registration show that, in recent years, approximately around 40000 children under 18 get married in Iran, annually. 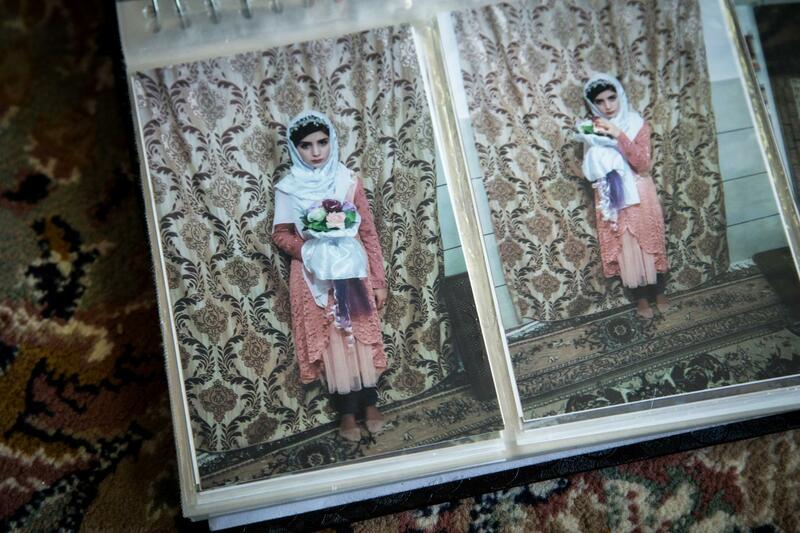 The photo collection presented, is a demonstration on the issue of child marriage in Iran. In some cases, a lot of these kids against the norm of their region’s culture and traditions were coerced to marry young. Younger than 18 and sometimes younger than 13. Jashn-e taklif is a big ceremony that holds for 9 year old student girl and 15 year old boys. When he or she reach a certain age and get matured , called " Mokallaf ". A person reaches the puberty ages must obey religious orders and obligations and conform to the rules which god has forbidden in Islamic rules. 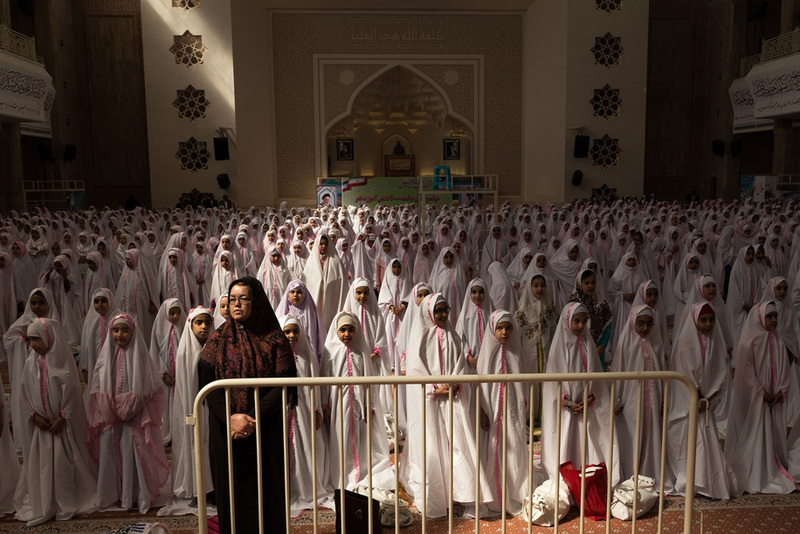 this is the image of Jashn-e taklif in Golestan province,located in north-east of Iran.Girls and their teachers stand back to an alter called "Mehraab" and face to "Imam Reza (8th imam of Shiite religion) Shrine" for praying Allah. Mina (on the left) is 9 and her sister, Maryam, is 11. Mina is in 3rd grade and got engaged three weeks ago. Maryam has finished elementary school and has been engaged for almost 7 months. In this image they are getting ready to go to party whit their mother. 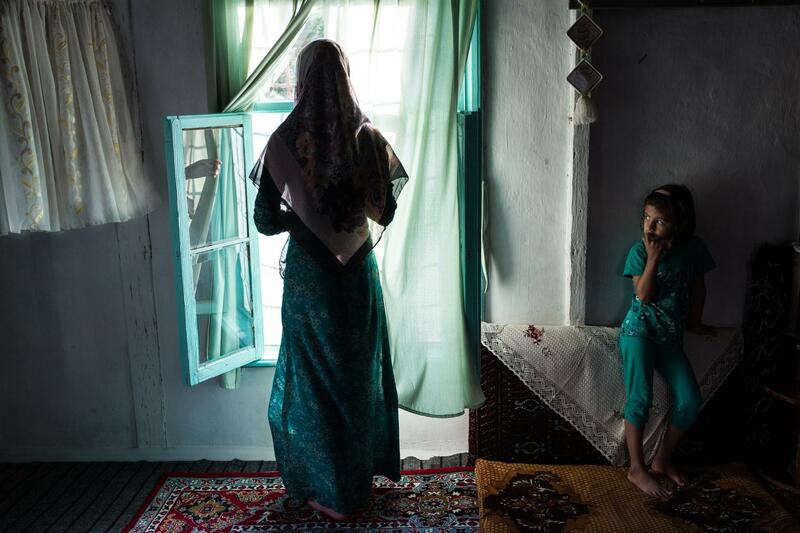 Maryam and Mina and their families live in a village in North Khorasan province called Bidak in northeastern Iran. North Khorasan has the second rank among low-marriage among Iranian provinces. Mina, 9, looks at her mother's hand in the right corner of the picture, showing me the engagement dress of Mina. Mina has been engaged 3 weeks ago in this photo with Mohsen, 17 years old. Mina lives with her family in the village of Bidak, North Khorasan province. 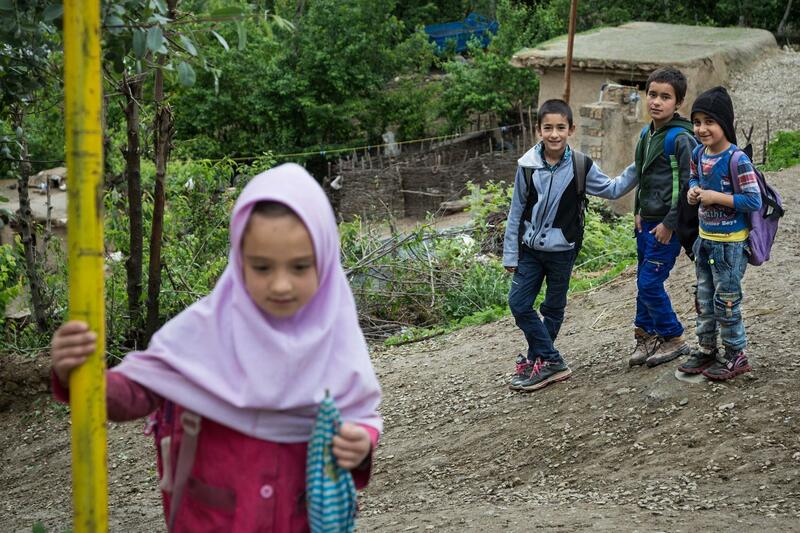 In the most village of Iran ,Lack of facilities cause that boys and girls are going to school together and are sitting in common classes. It is against the rules of Iran big cities. in this image children are coming back from their school in "Dozein" one of the eastern village of "Golestan" province, in north-east of Iran. Mina in center of this photo is 13 and she has engaged with Taghi about 3 months ago. Most of her classmates have married in this village and she liked to marry like her friends. 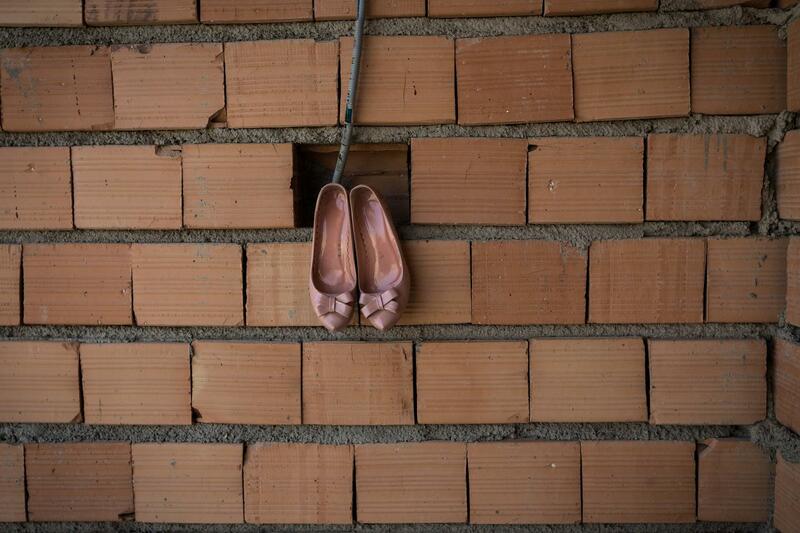 This photo captured from Mina in taghi's paternal house. She has moved in there from couple days ago to stay with Taghi. Taghi left school at second grade and has no desire to keep on his study. After their marriage, Mina has to leave school. When I asked them to stand next to each other, Taghi doesn't like me to take photo of his wife. These days, Taghi is building a house for themselves beside his father's in "BIDAk" village in "Northern Khorasan" province. 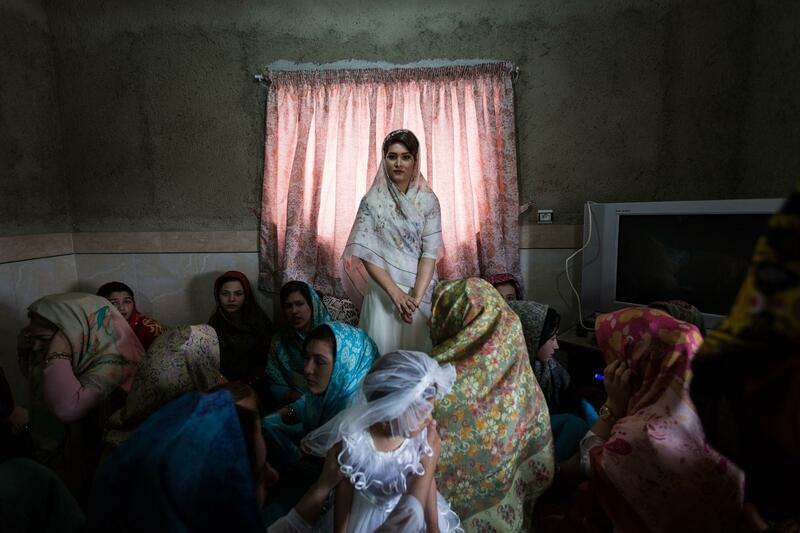 This is 16 year old Nafiseh`s wedding ceremony in"Char`oghli" village of "Gomishan" one of the western cities of “Golestan" province in north-east of Iran. She left school at 7th grade. Nafiseh stands in center of the image. A photo of an engagement ceremony held in ‘Bidak’ village located in ‘North Khorasan’, north eastern province of Iran. Maryam who has the engagement dress on, is 10 years old. 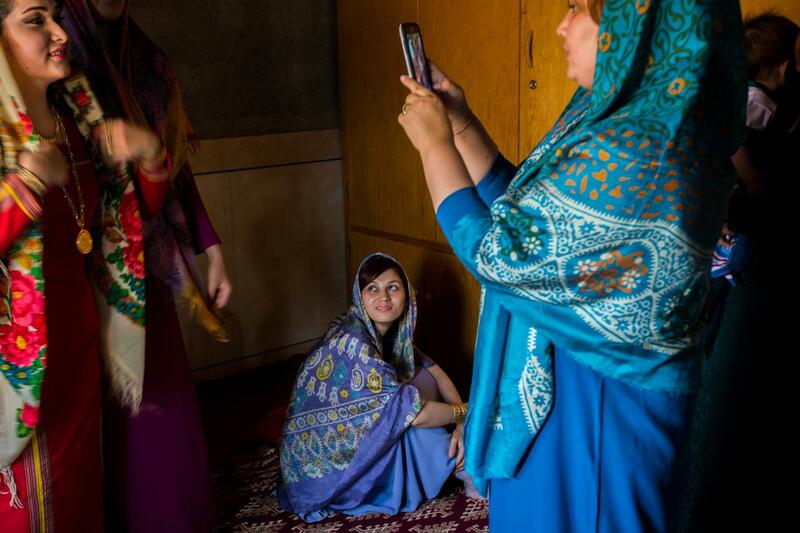 In the center of this image 16 year old Samaneh who is brilliant student at school ("Gomishan" one of the western cities of “Golestan" province in north-east of Iran).She lives in one the oldest house in the city with her parents and her little sister. She dreams to enter university after high school. She doesn't like to get married soon like her friends which are so common in their culture. Little girl in bride dress in wedding ceremony of 16 year old Nafiseh who lives with her parents in "Char`oghli" village of "Gomishan”, one of the western city of “Golestan" province,in north-east of Iran. Mina (on the left) is 9 and her sister, Maryam, is 11. Their 26 years old mother, Nahid, married when she was only 9. Despite her daughters are eager to study in high grades, they are not allowed, by their dad, to study beyond elementary school. Mina is in 3rd grade and got engaged three weeks ago. Maryam has finished elementary school and has been engaged for almost 7 months. When I asked their mother why your daughters got engaged so young, she answered “they have to grow up with their husbands to protect themselves from evil and sin." Maryam and mina have not started their puberty yet. 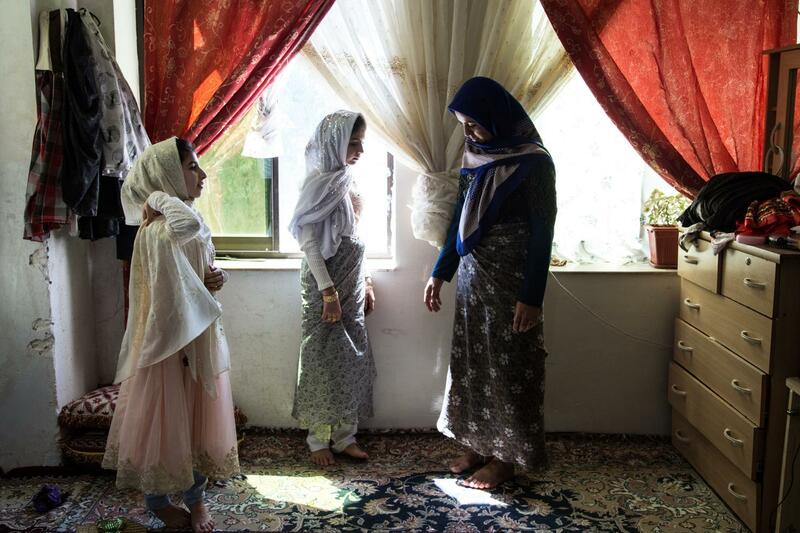 Maryam and Mina and their families live in a village in North Khorasan province called Bidak in northeastern Iran. North Khorasan has the second rank among low-marriage among Iranian provinces. 14 years old Shaghayegh (in the center) is sitting next to her husband Sirvan. She is watching the daughter of her passed away brother-in-law playing with her 6 months old daughter, Baran. 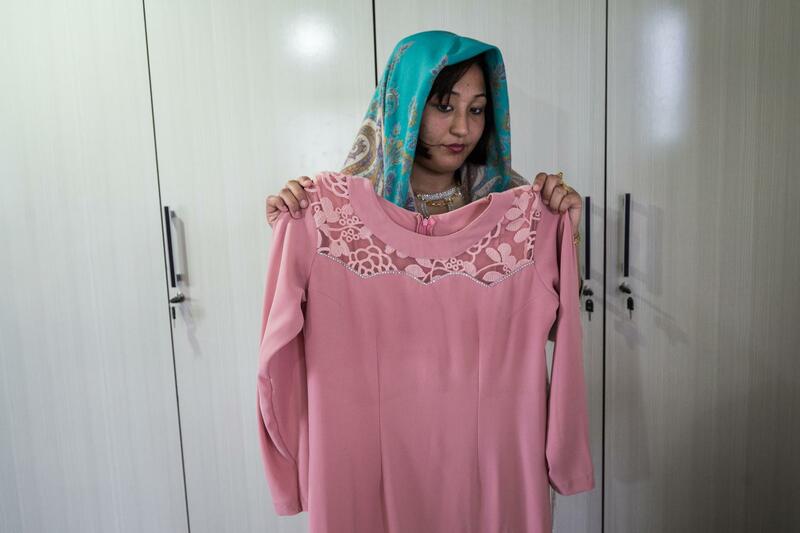 Forced by her stepmother, Shaghayegh married Sirvan when she was 11. After her mother passed away, she was not permitted to go to school and instead she was forced to work in her father’s field with her sisters so their stepmother has more time to herself away from children noises. She doesn’t have a good memory from her childhood and according to one of her brother-in-law she prefers to play with children when she is around her husband. When I asked her about her daughter, she said she unwillingly got pregnant when she was 13. Shaghayegh has high hopes for her daughter. 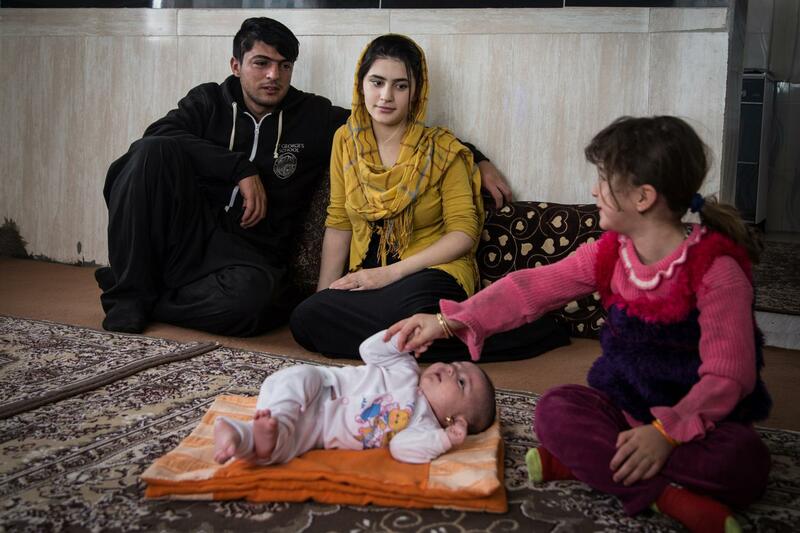 She lives with her husband’s family in ‘Dortafi’ village located in Kurdistan province, west of Iran. 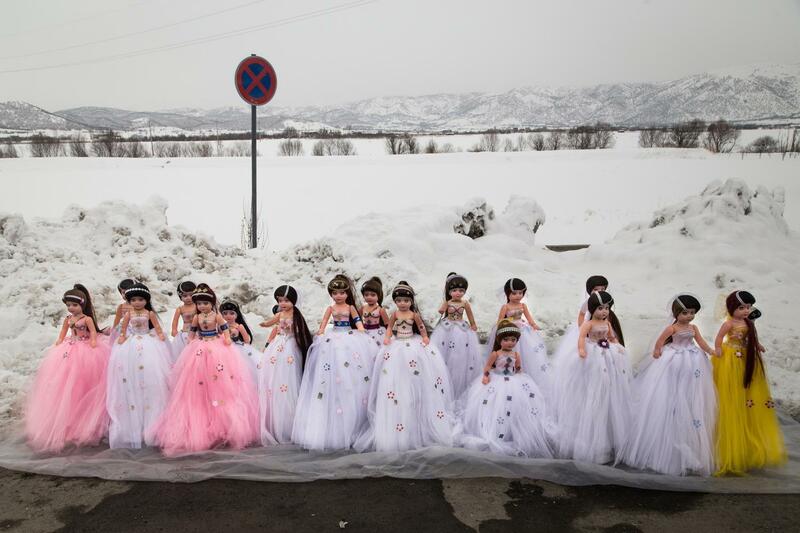 Dolls in Kurdish wedding dress are being sold by a peddler in Marivan, a city located in Kurdistan province, west of Iran. 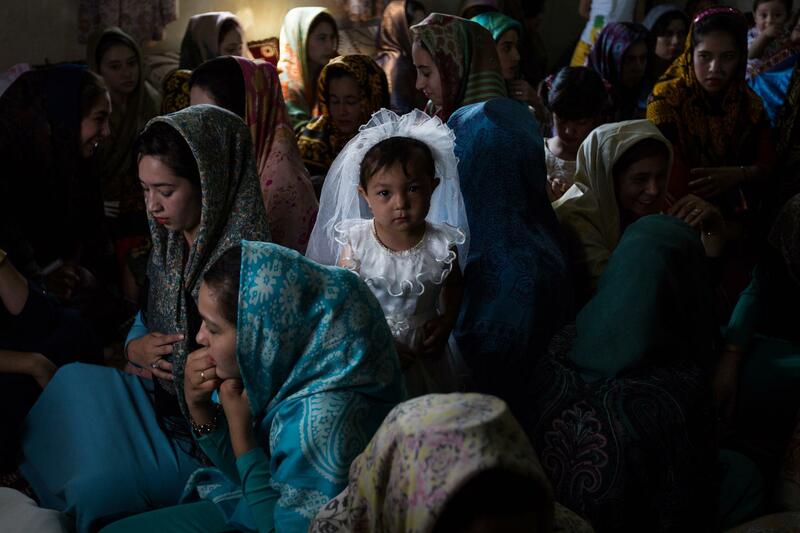 According to statistics, child marriage rate is high in this this province.